There are a lot of things that make me happy. And most of these things are not things that I can photograph and share. Many of them are intangible and would require a good bit of thinking on my part to share them. Especially, to share them well. But today, those are not the things I am sharing in this space. The things I am sharing today are quite tangible and photographable. And new. I must admit some pretty swell things came into my possession over Christmas. How have I gone this long without owning rain boots? And such lovely aqua ones at that! 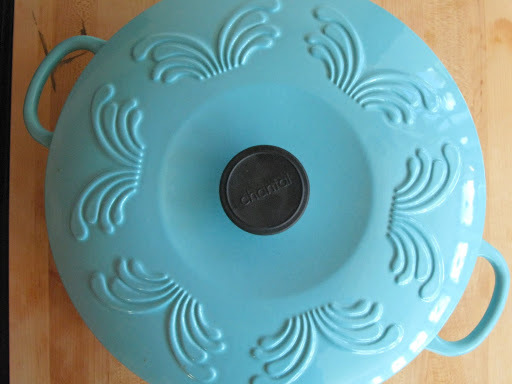 And speaking of aqua, how about this beautiful cast iron dutch oven? I have always wanted one and I believe Michael did a great job picking one out. I just keep staring at the lid. So pretty. Anyone have a great dutch oven recipe to share? 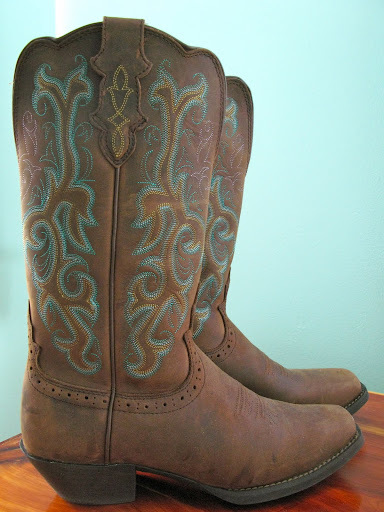 And what boot collection would be complete without some cowgirl boots? Well, not mine. I have wanted some for years and now I finally have a pair. Hmm, I am definitely seeing an aqua theme to my Christmas gifts. And look at those blue skies. This was just before Christmas when the weather was so beautiful. Now all that green is covered in white. We have had a lot of fun this past week watching the different birds visiting the feeder. I guess they are having a harder time finding food in the snow. And do you know what else makes me happy? That I have posted two days in a row. What?! Yep. Apparently my new rule is working for me. Have a great weekend! P.S. My dear friend, Kristi, has opened an Etsy shop. She has some great vintage and handmade items and some original photographs. Ooh, and she is hosting a giveaway right now. So, go check her out! I want to borrow those cowboy boots!! And I got a Dutch oven too. Mine is blue but darker. I posted a chicken stew recipe on fb tonight that I made in it. Yum! PS: cowboy boots are a new item on my list aswell ... I miss the south! I dub thee the Queen of Aqua Finery!! !